Ever since I first laid eyes on the area around my fireplace I've hated it. When we first looked at this house I thought it was awful and hoped that it could be fixed somehow. Over the years I've tackled other easier projects or more pressing ones. I'd decorate the living room around the ugly fireplace and try to ignore it. It was this huge black hole. Our living room only has one window and it faces our neighbors house so we don't get a lot of light. I've been trying to find ways to lighten the room and it had finally come time to do something about the fireplace. This was 3 years ago when we pulled up the badly laid tile and put in carpet. We also painted the bookcases/trim white (they were cream) The right bookcase had a magazine rack, not sure why... (we took that out). Close up of the UGLY "rock". 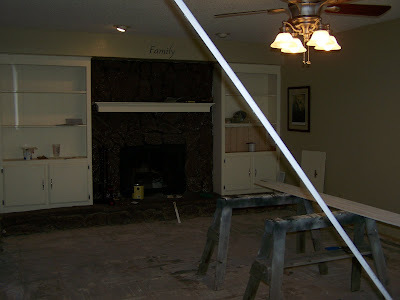 We thought that maybe we could try to pull it out and put up drywall in it's place. But I was afraid that it would end up being more than we could handle. Not to mention we just didn't have the money to put towards something that wasn't broke but so ugly. So I finally decided to paint it. It wasn't ideal but sometimes limited resources can force your creativity. I was hoping that by painting it a lighter color it would reflect light around the room and make it much lighter/brighter in there. This was a few months ago. It's just a black hole. I didn't really know what color to paint the ugly, so I talked to David about my idea and he suggested using a shade darker than the wall color. I liked that idea so I picked up the paint. This was a very time consuming painting project. I had to work on it in shifts. I think it took about 8 hours to finish over a few days. It was more shoving paint into cracks and holes than actual painting which was easy but took a lot of time. When I start painting something that I know I can't undo I get a little panicked at first. But with this project I figured if I didn't like it it would look better than the ugly. However I LOVE it!!! Instead of absorbing the light it's reflecting it back into the room again and it feels cleaner too! I love that paint does that! It also feels more modern which I'm starting to like the look of. Here it is finished. And the overhead light isn't even on! As you may have noticed I emptied out the room. I was inspired by The Nester's How to Edit a Room post to reevaluate how I wanted this room to look. It was feeling cluttered, busy, dark and not how I wanted it feel. I've been very drawn to white and lighter colors lately and wanted a more relaxed feel to the room. So when I was ready to paint the ugly, I took all the decor and pillows out of the room, leaving only furniture, lamps and some stuff on the walls. At first it felt very empty but after a couple of days I started to like the feel. It allowed me time to figure out what I loved, liked and wanted to change. I've been thinking about what I have that I want to put back in the room and what can stay out. Also if I want to repaint something or if I want some new items. I've really enjoyed clearing out the room, I don't think I would have made the same decisions had I left everything in the room. I'll share more about that soon. I challenge you that if you don't like the feeling of a room to clear it out and see how you feel about it. Also read the above mentioned post for more inspiration. It's a fun process!